Russian President Vladimir Putin called Saturday for economic sanctions against Turkey, four days after its air force shot down a Russian fighter jet near the Turkey-Syria border. Putin signed a decree Saturday ordering the sanctions, which restrict Russian imports of some Turkish products, prohibit extensions of contracts for Turks working in Russia and affect the operations of Turkish companies in Russia. The decree also calls for ending charter flights from Russia to Turkey and for Russian tourism companies to stop selling vacation packages that would include a stay in Turkey. Russia has been threatening retaliatory measures against Turkey since the warplane was shot down Tuesday, an incident that has heightened tensions between the two countries. Earlier Saturday, Turkish President Recep Tayyip Erdogan voiced regret about the downing of the Russian plane, saying his country was "truly saddened" by the incident and wished it had not occurred. Addressing his supporters Saturday in the province of Balikesir, Erdogan said he hoped tensions between Turkey and Russia over the incident do not escalate further and lead to dire consequences. He also said he hoped something like this does not happen again. Erdogan also renewed a call to Putin for a face-to-face meeting in Paris on the sidelines of the global climate summit on Monday. 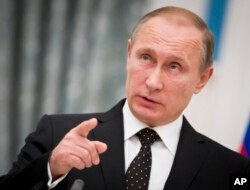 Putin, who reacted angrily to the downing of the Russian fighter jet, has yet to agree to the talks. FILE - Turkish President Recep Tayyip Erdogan makes a speech during his meeting with mukhtars at the Presidential Palace in Ankara, Turkey, Nov. 26, 2015. Also Saturday, Turkey advised its citizens to delay nonurgent travel to Russia. Turkey's foreign ministry said it issued the travel warning because of unspecified "difficulties" faced by Turkish visitors and residents in Russia. Turkey said it issued repeated warnings that the plane was in its airspace before shooting it down. Russia, which has been carrying out airstrikes in Syria since September, said the jet did not cross into Turkey. The plane crashed into a mountainside in a rebel-held area in Syria. Both pilots parachuted out of the burning aircraft after it was struck, but one was found dead in Syria while the second was found safe and unhurt. A Russian soldier was killed in a rescue operation. Russian President Vladimir Putin gestures while speaking to the media during his and France's President Francois Hollande news conference following the talks in Moscow, Russia, Nov. 26, 2015. Turkey said Sunday it is returning the body of the pilot who died.